To start this fly I wrap 5 turns of the SM Ultra Wire tight against the hook shank and position it just above/behind the hook barb then glue it in place with the Zap-A-Gap, remove both tag ends. I twist them off and never clip them free with scissors, it saves your blades and leaves a cleaner looking finish. I typically prep a dozen in one color before I sit down to tie the batch. This has also been an effective pattern with Red and Green Ultra Wire as well. The body is made with the peacock herl wrapped close to form a bushy full body and finished with 1-2 turns of a soft-hackle, on my #14 flies I used traditional Partridge but for the #16’s I used this white soft-hackle that came free with a dry fly hackle I purchased a while back, both have proven to take trout. I measure the hackle from just behind the hook eye back to the wire above the hook barb. I’ll fish this pattern dead drifted behind a nymph but I find it best fished on the swing or by lifting your rod tip to bring the fly up from the bottom. This tends to trigger the desired behaviour again and again. This is a good attractor pattern that might be simulating a pupating caddis or perhaps a cased caddis that is peeping, either way this fly takes trout. Good luck. p.s. This video was taken in HD format with the Panasonic Lumix TS-1. I have been following this site for a little while and was hoping you would post a recipe for this fly. Your welcome. I hope to do more videos/flies now that I have a camera that can handle HD video. Take care. Damn. So f–kin dope. Home drinking beer after work and feeling buzzed and this is so f–kin dope. Yea!! I love it. Glad you dig it man. Good tune too. Aren’t peacock bodies that are not reinforced with either wire or thread very fragile? For the most part yes. but I have very fresh herl that I get from a person who owns Peacocks and the herl is never brittle. Also I only plan to fish these for a season or two, by then I will be forced to tie more because I will have given them away, lost them or fished them to the point of no return. I am considering using SM Black Ultra wire to strengthen the body but I don’t want to add much flash. Thread would work too but none of the flies I’ve tied have failed with the peacock herl. If they begin to, I will tie the next batch differently. Nice pattern and I tied some up after your last post about this fly. Very effective fly so thanks for sharing it! Used it this morning before work and took several fish. Thanks again and great blog. I’ve been following it for a while now and enjoy the posts. Brian, thanks for letting me know this thing works for someone else around here. I’ve handed a few off to others but it’s not a pattern I’ve seen people talk about or fish in the driftless area. 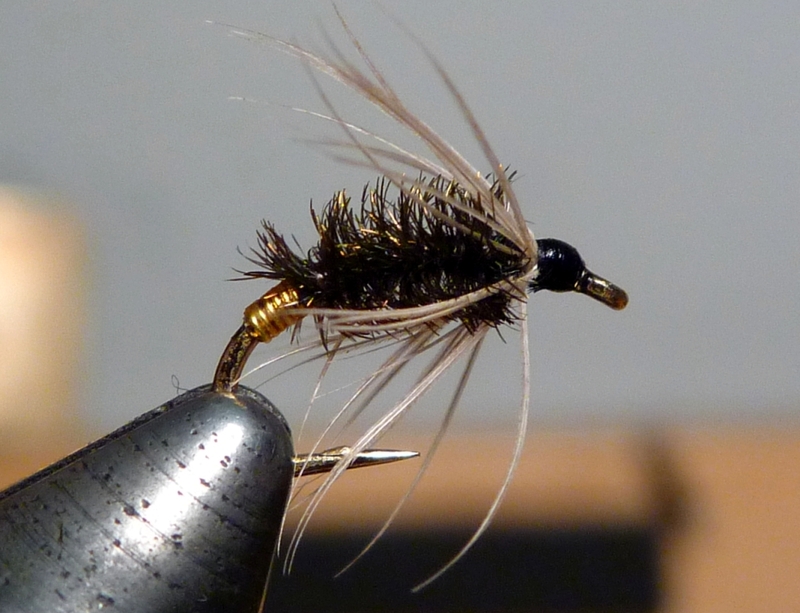 I know there are lots of soft-hackle patterns but this one is rather specific and is more known in California. Glad this information is helping others. Nice job of fly tying. I can do without the song about “sweet cocaine.” Illegal drugs have ruined a lot of lives. No need to promote them. I agree Walt, I’ll think twice before using another song with any referances. Glad you like my tying though. Take care. ran across a fellow using a similar pattern in colorado a couple of summers ago. his wire was the body not the tag and the herl was a collar not a body. Thanks Craig, I think I’ve got a pretty good idea of what your describing, might have to sit down and tie a few up. Take care.